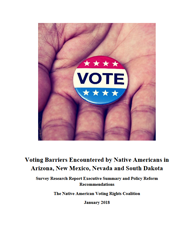 To begin its work, the NAVRC needed a more complete understanding of the types of barriers that Native Americans face in trying to access the ballot box. 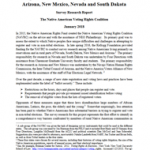 In late spring 2016, the Kellogg Foundation funded the first comprehensive, multi-state study of the problems and challenges facing Native American voters. The survey addressed: 1) voter eligibility, 2) political engagement, 3) registering to vote, 4) voting, and 5) demographic information. Results from that initial survey (see the executive summary and the full survey results) indicate that there is a variety of problems affecting access to the polls, each requiring a different strategy in order to resolve it. To build upon the survey, in September 2017, NAVRC began holding field hearings across the country. The hearings created a documentary record of the circumstances surrounding voting in Indian Country, identifying the unique needs and challenges faced by Native voters. Learn more about the field hearings.